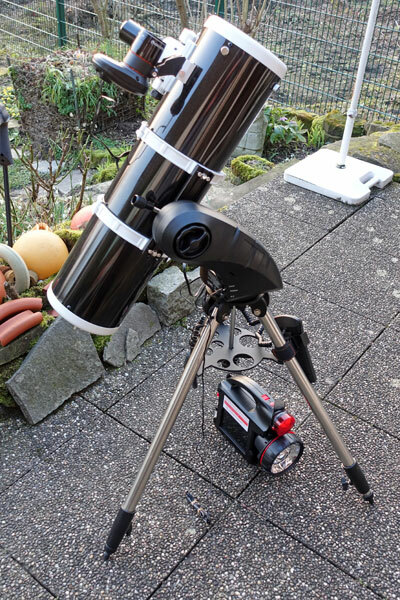 One day after the arrival of the StarSense module, that is, on February 8,2018, the sky was clear in the afternoon and early evening, so that I took the opportunity to test the module on the Explorer 150PDS for the first time. What followed was a frustrating experience in which three things played their part: my own ignorance, errors and inaccuracies in the manuals, and finally clouds that prevented further testing. After I had built everything up, it was still too bright, so that the automatic alignment failed twice. Then the mount did not want to move the telescope anymore. So I turned it off and on again - after that the telescope moved again. And soon it was dark enough so that the automatic alignment was successful. Inside, I had time to think about this matter, while cleaning the Ruccola salad, and I realized that although time information was requested, no location information was asked for. This might, of course, be the reason for the poor alignment. After supper, I took the mount with telescope and module into the kitchen, found the location entry only via the menu system (which is probably the only possibility nowadays), and there I found that Torrance in California, the Celestron headquarters, was set as location. In Germany, only Frankfurt and Munich were offered as the closest locations for me, but when reading the manual I found out what the little "ball" on the right wanted to tell me: I might press the "Celestron" key on the hand control for more input options - and this way, I was able to enter the coordinates of the village where I live. The next day I tried to answer my questions and solve my problems by reading manuals, surfing the Internet, watching YouTube videos (which I had already watched some time ago) and trying out the controls "live." Here are my results! At YouTube, I first came across a video from Celestron describing the set-up of the StarSense module. In this video, the speaker just enters the time and the starts the Auto Alignment, just as the gentlemen and I experienced it. Maybe, the Celestron people never left Torrance, CA, and thus, it worked for them... Anyway, I also found in another video, that you have to enter the location via the menu only once, that is, when using the module for the first time. Unique, of course, only if you observe in one place only or stay close to it. I do not know why the necessity to enter the location via the menu once (or several times) has not found its way into the Celestron video or the manual in its different versions. The fact that the feature is described elsewhere in the manual is no excuse for not mentioning it during setup. 5. Press ENTER, once the star is in the field of view of your eyepiece. The hand control is now in fine centering mode, which has a slow slew speed. After calibration, the German user manual (and older English versions) requires the user to switch the module off and on again, while the new English version does not. What is correct? I have not been able to clarify this "empirically" so far, but I assume that it works without this step (I found similar contradictions between manual versions for the Sky-Watcher Virtuoso Mount...). "Second Light" - Now It Worked! Enter the menu "Time and Location" for setting location and time check and/or set these. Since I had already set the location and it was still correct, I was quickly finished here. Date and time had to be updated; this would also be possible later when doing the "Auto Align," but since I was already in the respective settings, I did this here. First "Auto Align": Since it was dark enough, this worked out right away! Press the "STARS" key, select menu item "Named Stars," then select a star and let the mount point to it. I selected Aldebaran for this (pointing was pretty close...). Press the "ALIGN" key (instead of the complex path described in the Celestron video...): This will take you to the "Calibrate" menu item (in the undocumented "StarSense" menu). After pressing "ENTER" you are in the coarse calibration mode, another "ENTER" press forwards you to the fine calibration mode. If the object is well centered in the eyepiece, exit it by pressing the "ALIGN"button again. StarSense now takes a picture of the sky and, after some calculations, completes the calibration. Finally, you will be prompted for another "Auto Align." 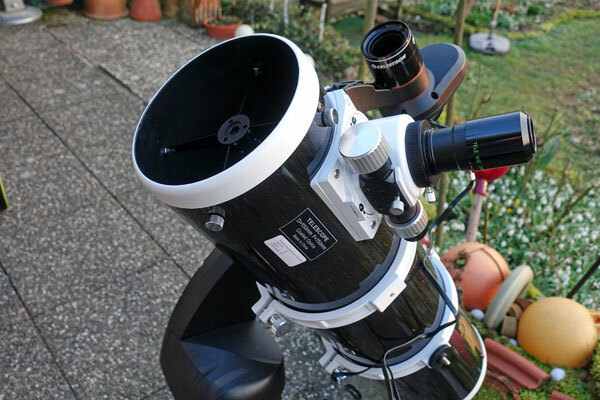 According to the "latest" manuals, the StarSense module no longer needs to be switched off and on again, and the telescope tube no longer needs to be aligned horizontally before pressing the "ALIGN" button and selecting "Auto Align" for a second time. After a successful second "Auto Align," the StarSense module is calibrated and aligned to the telescope so that you can start observing. Alternatively, you may want to increase the pointing accuracy by adding more targets, which I have not tried yet. After successfully completing this procedure, I checked the alignment accuracy on some targets (M 35, M 36, M 37, M 38, M 38, M 42, M 45, M 31, NGC 884/869). It needed improvement, but I did not want to spend any more time with aligning it, because I wanted to connect the Atik Infinity camera to the telescope. The accuracy proved sufficient for this purpose, because the targets (M 35, M 36, M 37, M 38, M 42) were still visible in a corner of the image so that centering them was not a problem. If the accuracy is not good enough the next time, I will try to use additional targets to improve the pointing accuracy, or alternatively try the "HELP"function to improve the alignment. 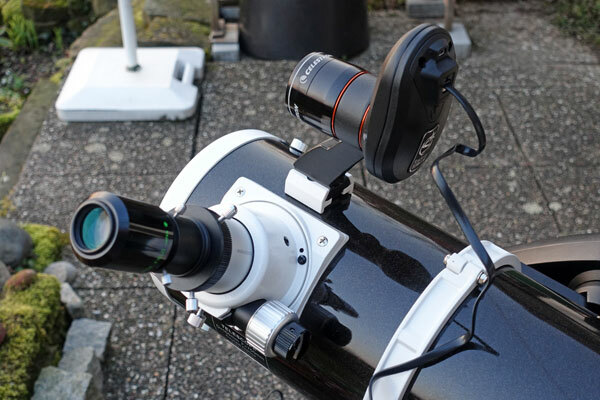 When I purchased the StarSense module, I hoped to be able to operate it on three different telescope tubes. This is theoretically possible, but every time I change the telescope tube, the module has to be recalibrated, which is quite arduous according to my astronomy dealer Mr. Kloß - he advised against this. My preliminary conclusion, after my initial failure, is that Celestron does neither the buyers nor itself a favor by delivering the StarSense module with an outdated and misleading (or also wrong...) manual. I probably would never have been able to get the module up and running without a lot of try-and-error and searching the Internet. What a pity!